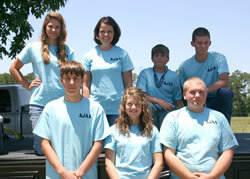 These juniors will serve on the Alabama Junior Angus Association board and are pictured at the 2012 Alabama Angus Association Field Day and Junior Preview Show, June 1-2 in Gordon, AL. Pictured front row from left are Joseph Adams, Union Springs, AL, vice president; Hannah Whitecotton, Pisgah, AL, secretary-treasurer; and James Barton, Dutton, AL, reporter. Directors kneeling from left are Caroline Nichols, Graceville, FL; Courtney Buchanan, Cleveland, AL; Wyatt Hubbard, Union Springs, AL; and Chandler Langley, Camp Hill, AL. These juniors were selected to represent Alabama as voting delegates to the National Junior Angus Association Annual Meeting this July in Louisville, KY. Pictured from left are Hannah Whitecotton, Pisgah, AL; Caroline Nichols, Graceville, FL, alternate; and Cody Owens, Pisgah, AL, alternate. 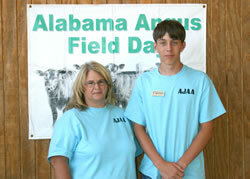 Courtney Buchanan, Cleveland, AL, right, received the Alabama Angus Auxiliary scholarship. 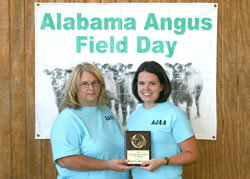 Pictured presenting the award is June Wood, Alabama Angus Auxiliary vice president. 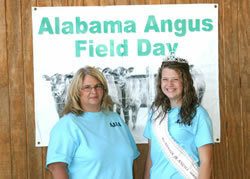 Hannah Whitecotton, Pisgah, AL, right, was crowned Miss Alabama Angus. Also pictured is June Wood, Alabama Angus Auxiliary vice president. Joseph Adams, Union Springs, AL, right, was named Alabama junior ambassador Also pictured is June Wood, Alabama Angus Auxiliary vice president. Photos by Richard Dyar, American Angus Association. AED Columbus 205Z won Reserve Grand Champion Bull at the 2012 Alabama National Fair Angus Show, Oct. 12 in Montgomery, AL Allison Davis, Shelbyville, TN, owns the January 2012 son of Connealy Final Product. He first won Junior Calf Champion. 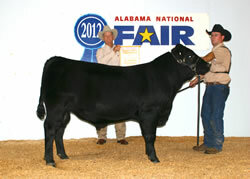 HH Raven Q 033 won Grand Champion Bull at the 2012 Alabama National Fair Angus Show, Oct. 12 in Montgomery, AL. Hannah Whitecotton, Pisgah, AL, owns the October 2010 son of BC 7022 Raven 7965. He first claimed Senior Champion Bull. L A Brand Name 146 won Reserve Grand Champion Bull at the 2012 Alabama National Fair Angus Show, Oct. 12 in Montgomery, Ala. Zachary McCord, New Market, AL, owns the September 2011 son of S A V Brand Name 9115. He first claimed Senior Calf Champion. 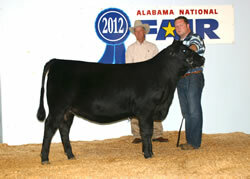 DVF Final Product 1407 won Reserve Senior Bull Calf Champion at 2012 Alabama National Fair, Oct. 12 in Montgomery, AL. Kendall Norris, Eldridge, AL., owns the winning bull. 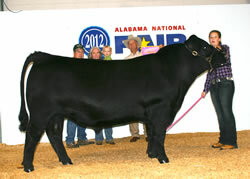 Q V S Georgina 2031 won Grand Champion Female at 2012 Alabama National Fair Junior Show, Oct. 13 in Montgomery, AL. Jake Smith, Cullman, AL, owns the February 2011 daughter of S A V Bismarck 5682. 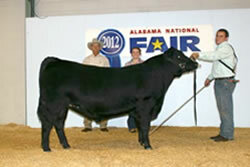 EXAR Blackbird 1408 won Reserve Grand Champion Female at the 2012 Alabama National Fair Angus Show, Oct. 12 in Montgomery, AL. 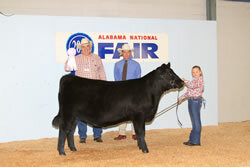 Kendall Norris, Eldridge, AL., owns the January 2011 daughter of Dameron First Class. She first won Reserve Junior Champion. 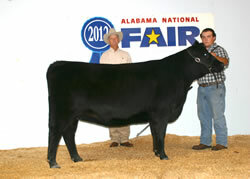 Tates Blackcap 5AR1 OCR3 won Senior Champion Female at 2012 Alabama National Fair, Oct. 12 in Montgomery, AL. Cody Owens, Pisgah, AL, owns the winning female. 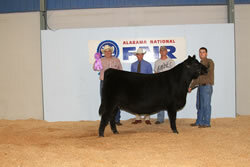 HH Bridget 067 won Reserve Senior Champion Female at 2012 Alabama National Fair, Oct. 12 in Montgomery, AL. Hannah Whitecotton, Pisgah, AL, owns the winning female. 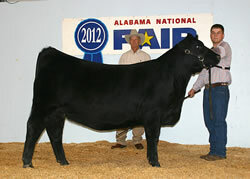 Champion Hill Elba 8004 won Intermediate Champion Heifer at 2012 Alabama National Fair, Oct. 12 in Montgomery, AL. 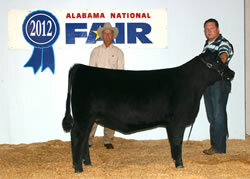 Jake Smith, Cullman, AL., owns the winning heifer. 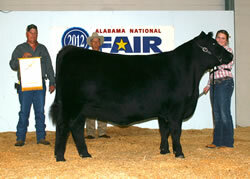 EXAR Empress 1193 won Reserve Intermediate Champion Heifer at 2012 Alabama National Fair, Oct. 12 in Montgomery, AL. Kendall Norris, Eldridge, AL., owns the winning heifer. 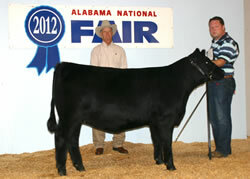 Banner Miss Empress A13 won Senior Heifer Calf Champion at 2012 Alabama National Fair, Oct. 12 in Montgomery, AL. Mackenzie Bracewell, Eagleville, TN, owns the winning heifer. Champion Hill Phyllis 8053 won Reserve Senior Heifer Calf Champion at 2012 Alabama National Fair, Oct. 12 in Montgomery, AL. 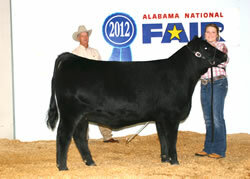 Katie Smith, Cullman, AL., owns the winning heifer. 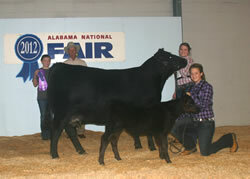 Banner Polly A53 won Junior Heifer Calf Champion at 2012 Alabama National Fair, Oct. 12 in Montgomery, AL, Wayne Banner, Eagleville, TN, owns the winning heifer. 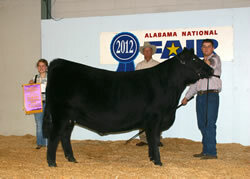 Banner Blackbird Gracie A45 won Reserve Junior Heifer Calf Champion at the 2012 Alabama National Fair Angus Show, Oct. 12 in Montgomery, AL. Michael Banner, Spring Hill, TN., owns the winning heifer. 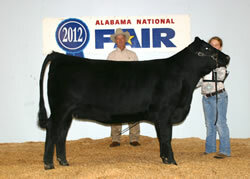 CCF Blackberry 114 won Reserve Grand Champion Female at 2012 Alabama National Fair Junior Show, Oct. 13 in Montgomery, AL. 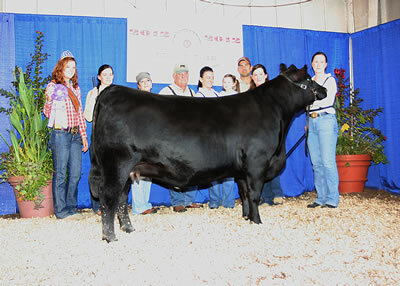 Oliva Powers, Clanton, AL, owns the November 2011 daughter of S A V Bismarck 5682. Photos by Shelia Stannard, American Angus Association. 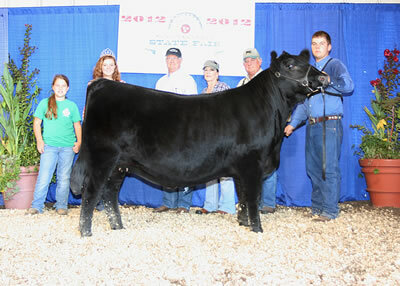 J K S Miss Cheyenne 4200 won Senior Champion Female at the 2012 Tennessee State Fair Roll of Victory (ROV) Angus Show, Sept. 9 in Nashville, TN. Jake Smith, Cullman, AL, owns the winning female. 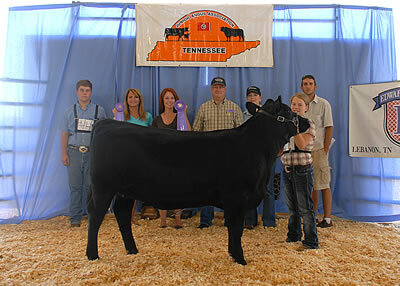 Q V S Georgina 2031 won Grand Champion Female at the 2012 Tennessee State Fair Junior Angus Show, Sept. 9 in Nashville, TN. Jake Smith, Cullman, AL, owns the February 2011 daughter of S A V Bismarck 5682. Travis Pembrook, Fairview, OK, evaluated the 21 entries. Photos by Ellen Hoffschneider, American Angus Association. Champion Hill Phyllis 8053 won Grand Champion Female at the 2012 Tennessee Angus Association Preview Show, June 23 in Lebanon, TN. 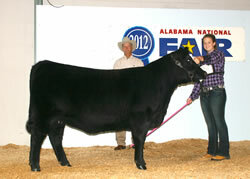 Katie Smith, Cullman, AL, owns the September 2011 daughter of S A V Brave 8320. She first claimed Calf Champion. John Davis, Blue Mountain, MS, evaluated the 62 entries. 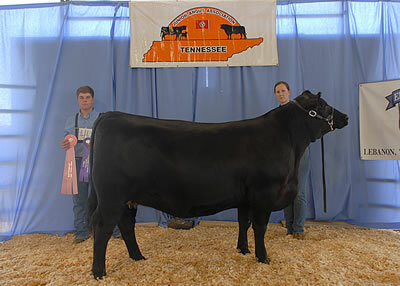 J K S Miss Cheyenne 4200 won Reserve Grand Champion Female at the 2012 Tennessee Angus Association Preview Show, June 23 in Lebanon, TN. Jake Smith, Cullman, AL, owns the September 2010 daughter of S A V Mandan 5664. She earlier won Senior Champion. John Davis, Blue Mountain, MS, evaluated the 62 entries. 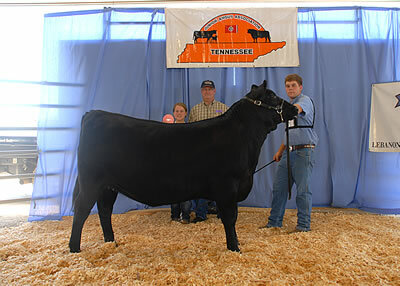 Q V S Georgina 4491 won Junior Champion Heifer at the 2012 Tennessee Angus Association Preview Show, June 23 in Lebanon, TN. Jake Smith, Cullman, AL, owns the winning heifer.